Teachers’ professional development was started from 6th April, 2018, every 7th period of Day 5. Till now we had seven days. DAY 1 (6th April): The project was started with the discussion with the members on what we would like to begin with. Since the aim of the project is to emphasize the development of teaching skills, we thought it would be great to start with the sharing of teaching methods and techniques of the members to enhance and enrich one’s skill. 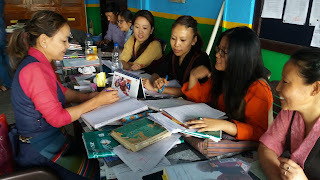 DAY 2 (13th April): The session started with the teaching methods of ‘Poetry’. We think it really worked well as we could share lots of things. DAY 3 (20th April): ‘Teaching Prose’ was done on the day 3 and we had all the techniques and methods shared in the report book. DAY 4 (27th April): We were not able to do it on this day as we had two members on leave. So we discussed on the common errors students make. (14th April – 19th April). After a long discussion we enclosed the decision that the concern teachers would take in charge and divided the day for each batch. DAY 6 (11th April): We had ‘Spelling Bee’ on 18th April so this period was spent on how and who would host the program and how we are going to get ready with the words for the bee. DAY 7 (18th May): We had the spelling bee practice since we have new teachers taking the rounds.